There were fine SCFL division-one wins for Midhurst and Selsey - with the Stags grateful to hat-trick hero Kieran Carter and the Blues leaving it very late to secure three points. Midhurst produced another win in cold and blustery conditions – taking their recent points tally to 19 out of a possible 21. The Stags groundstaff had worked tirelessly since the midweek game against Wick was postponed to ensure the fixture went ahead. Kieran Carter was the man of the moment scoring a fine hat-trick. His first came against the run of play after ten minutes. Aaron Behan, in a new position of right-back, played a 50-yard diagonal ball which found Kieran Carter, whose deft header sailed over the visitors’ stopper and in. Midhurst found it hard to create many more chances. The visitors looked the more likely to get the next goal and might have got a penalty on 20 minutes. A weak effort trickled towards Billy Nash in the Stags goal and he found himself wrongfooted. A heavy touch from the Stags keeper saw him into Seaford’s centre-half, who was booked for diving. Seaford continued to harry the Stags and had several chances that went wide or over. The second half started well for Midhurst although the rain and snow kept on coming down. Nash and the Stags back four of Behan, Mark Broughton, Duncan Brown and Harry Tollworthy looked solid and steady, complemented by Rich Carter in the holding midfield position. This seemed to allow the hosts’ frontline to get going with Harry Giles and Lewis Hamilton dictating central midfield. Kieran Carter on the left and Liam Dreckman on the right began to drive at the full-backs, causing all sorts of problems. Gary Norgate up top began to hold the ball up, bringing his team-mates into play, exactly what manager Shane Brayson and assistant Dean Inman had ordered. Goal two came on 60 minutes. Neat play from Kieran Carter and Norgate set Giles free and he raced into the area only to be tripped. Kieran Carter stepped up to slot home his and Midhurst’s second. With conditions worsening Seaford wanted the game called off. But although it was extremely wet the ball was running with no problem. Midhurst seemed to relax and they conceded on 67 minutes. A corner was cleared by Norgate but the follow-up cross was tapped home by the Seaford centre-back. Seaford searched for an equaliser. They had several attacks thwarted only to be caught on the counter on 82 minutes. Big centre-half Brown played a searching ball from back to front to find Hamilton, who picked out Norgate. The striker set Kieran Carter up to smash home from 18 yards to secure his hat-trick. Midhurst go to Little Common this Saturday. Midhurst: Nash, Behan, Brown, Broughton, H Tollworthy (Casselton 70), R Carter (Balogun 75), Hamilton, Giles, Dreckmann, Norgate (Johnson 88), K Carter. Sub not used: M Tollworthy. 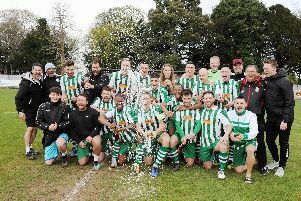 The goals flowed at the High Street Ground in a highly-entertaining clash – and Selsey stunned their visitors by coming from 2-0 to win 3-2 in a dramatic final few minutes. The fixture had been in doubt because of persistent rain throughout the morning on an already-waterlogged pitch but the referee deemed it playable. In the first half both teams tried to play and in patches they managed some decent football, without creating real goalscoring chances. The second half started with both teams working hard to deny the opposition time and space on a deteriorating pitch. On 74 minutes Mile Oak broke forward and substitute Jack Stenning finished well to put the visitors in front. Selsey pushed forward and Mile Oak were dangerous on the break and the visitors scored again just four minutes later when Andy McDowell benefitted from slack Selsey defending to seemingly clinch the points. Selsey had other ideas and were back in the game when influential substitute Frazer Smith sent a slide-rule pass to Jake Goulding and he finished calmly. Mile Oak sat back inviting pressure from the home side and that proved costly as they gave away a free-kick 30 yards from goal. The kick was fired across by Smith and James Kilhams towered above his marker to head home for 2-2. The Blues were not satisfied and continued to pile on the pressure and another free-kick was cleverly worked by skipper Ryan Morey and Smith, who crossed along the six-yard line for 16-year-old Jamie Williams to bundle home his first goal in senior football. An amazing final 20 minutes left the home supporters very happy they had turned up to support the Blues on a cold, wet day. The Blues now face five away games on the spin – starting at Southwick on Saturday.